Genesis Chester Cheetah: Wild Wild Quest (USA) in 09:45.69 by Jigwally. 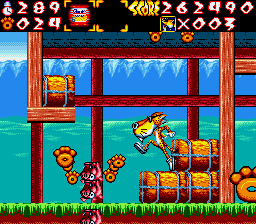 Chester Cheetah: Wild Wild Quest is a 1993 video game that starred Cheetos mascot Chester Cheetah. It is the sequel to Chester Cheetah: Too Cool to Fool. The game is designed much like Super Mario World in that the player navigates through levels in a map, jumps up platforms, and bashes blocks. Players must explore the entire United States, looking for 10 pieces of a map to Hip City, USA while avoiding or defeating enemies. Levels include a ship, the front of a castle, the bottom of the sea, and a city. Jigwally bounces around, stomps on bosses, and moves his feet really fast to beat the game and become Hip himself in just under 10 minutes.